The Province of Silesia (German: Provinz Schlesien; Polish: Prowincja Śląska; Silesian: Prowincyjŏ Ślōnskŏ) was a province of the German Kingdom of Prussia, existing from 1815 to 1919, when it was divided into the Upper and Lower Silesia provinces, and briefly again from 1938 to 1941. As a Prussian province, Silesia became part of the German Empire during the Prussian-led unification of Germany in 1871. The provincial capital was Breslau (present-day Wrocław, Poland). Immediately after the coronation of Maria Theresa as Bohemian queen regnant, King Frederick the Great of Prussia had invaded Silesia, thereby starting the War of the Austrian Succession (1740–1748). By the end of the First Silesian War in 1742, the Prussian forces had conquered almost all of the Habsburg crown land, while according to the peace treaties of Breslau and Berlin, only some smaller parts in the extreme southeast, like the Duchy of Teschen as well as the southern parts of the duchies of Troppau and Nysa, remained possessions of the Habsburg Monarchy as Austrian Silesia. Attempts by Maria Theresa to regain the crown land in the Second Silesian War (1744–1745) failed and she ultimately had to relinquish her claims by the Treaty of Dresden. The Frederick Augustus I of Saxony had to relinquish due to his indecisive attitude in the Napoleonic Wars. As the lands had been part of the Holy Roman Empire until 1806, Silesia was among the western Prussian provinces that laid within the borders of the German Confederation. The character of the province's eastern third, Upper Silesia, had been much lesser shaped by the medieval German Ostsiedlung. According to the census of 1905, about three-quarters of the Silesian inhabitants were German–speaking, while a majority of the population to the east of the Oder river spoke Polish (including Silesian and Lach dialects). Because of the extended iron ore and black coal deposits of the Upper Silesian Coal Basin, there was considerable industrialization and urbanization in Upper Silesia and many people from neighbouring Posen and Congress Poland immigrated at that time. The Upper Silesian Industrial Region was the second largest industrial agglomeration of the German Empire after the Ruhr area. Over decades the mainly Catholic Upper Silesian citizens in majority voted for the German Centre Party, while the Lower Silesian constituencies were dominated by the Free-minded Party and the Social Democrats. Ethnic tensions rose on the eve of World War I, with politicians like Wojciech Korfanty separating from the Centre Party and giving utterance to distinct Polish interests. After the war, the parts remaining in Regierungsbezirk Oppeln) in 1919. 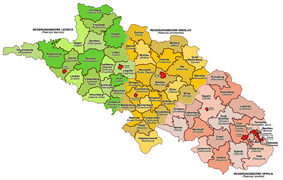 After three Silesian Uprisings and the 1921 Upper Silesia plebiscite, the East Upper Silesian part of the province around the industrial town of Katowice (Kattowitz) was transferred to the Second Polish Republic and incorporated into the Silesian Voivodeship in 1922. Further, in 1920 the Hlučín Region was ceded to Czechoslovakia according to the Treaty of Versailles. After the Nazi Germany conquest of Poland in late 1939, the Province of Silesia was extended when a part of Poland was merged into that province. In 1941, the Province was divided again.